Good things truly do come in threes if you're a fan of Google's Chrome OS. 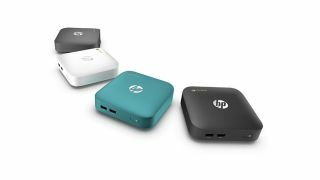 Not long after Asus and Dell threw their hats into the Chromebox ring, HP has come out with a compact PC of its own. Initially launching in spring 2014 in the US, the HP Chromebox promises to be an uncomplicated affair. Whack the 5-inch box wide on your desk, hook it up to an external monitor or TV via HDMI or DisplayPort and you're good to delve into Google's cloud-based ecosystem. It's no slouch either: the device comes armed with a Haswell-powered Intel Core i7 CPU inside. Though that may seem like overkill for a PC that essentially functions through a Chrome browser, it's also compatible with Google's Chromebox for meetings videoconferencing service that leans on raw compute power to stream 1080p video. As such, HP is pitching it as a device that straddles the middle ground between business and pleasure. Companies can manage and configure the device through a web-based management console, and a built-in TPM (trusted platform module) is included for security. Other features of note include a built-in VESA mount, four USB 3.0 ports, Bluetooth and the choice of three colour options - black, white or "ocean turqoise". HP hasn't unveiled global availability or pricing for the model yet, but the inclusion of a chip from Intel's more powerful line of processors should ensure that it retails at slightly more than recently-unveiled competing models. How is Google making the Chromebox fit for business?